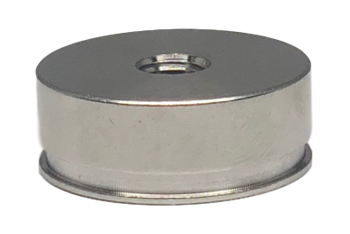 STI's CMCP200E Adhesive Mounting Pads were designed for applications where the mounting surface cannot be drilled and tapped. The CMCP200E features a abraded collar around the bottom of the pad to allow for superior adhesive bonding to the pad, ensuring accurate high frequency response. For the adhesive, STI recommends our CMCP210 Adhesive Bypac. Protective caps may be purchased separately to keep unwanted paint ad debris off the mounting pad when used as a target or mounting surface for portable data collection.